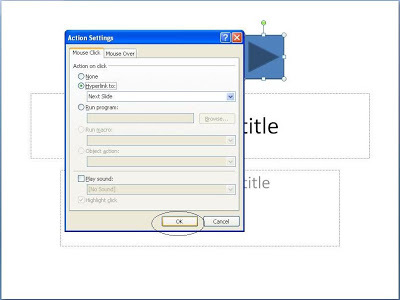 After learn about hyperlink (read: Create a Hyperlink at powerpoint) now we can also learn about action button. 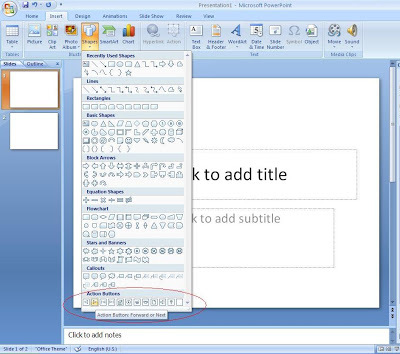 An action button is a ready-made button that you can insert into your presentation and define hyperlinks for. Action buttons contain shapes, such as right and left arrows, and commonly understood symbols for going to next, previous, first, and last slides, and for playing movies or sounds. On the Insert tab, in the Illustrations group, click the arrow under Shapes, and then you will see at action button category. Click under action button, then click forward or next button, and then drag mouse in slide.